With orange Gerberas, orange Asiatic Lilies and purple Iris, this persuasive bouquet evokes such a positive and potent feeling of ardour, its as though being hit by a cupids arrow. Anyone who receives it will feel giddy with love and affection. 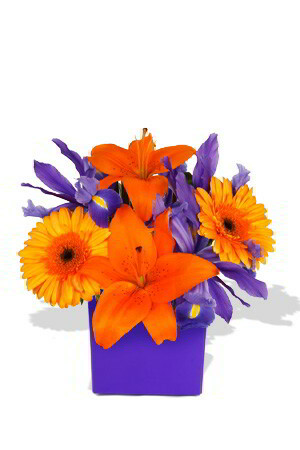 If you desire a positive reaction to your gift, send Ardour to the object of your affection today.Lilies may be sent closed/partially closed in order to prevent damage and to last longerVase not included however; to add to the element of surprise, zFlowers.com recommends including a Premium Vase with your order. DELIVERY WAS ON TIME AND RECIPIENT LOVED THE ARRANGEMENT I SENT. My sister absolutely loved the flower arrangement sent for her 76 birthday.